Originally featured on The Salvation Army Western Territory's Expect Change blog. When I was in college, my friends and I probably sat around the dorm late at night talking about fraternity boys. Definitely clothes. Maybe – but not likely – school work. Not so for Thomas Doochin, Taylor Sharp and Jake Bernstein. As freshmen at the University of North Carolina (UNC), their late night conversations were about giving: specifically, how to revolutionize giving by making it easy and meaningful for those with lots of resources to be matched with those who have few. Those chats about giving in the wee hours turned into CommuniGift, an online platform that allows charities to create offline programs online like Adopt-A-Family or product drives. But even more important, it gives a family, company or individual the opportunity to make a connection with someone who needs help. To get it up and running, Doochin, Sharp and Bernstein got advice from business leaders and they began working the phones to find an organization willing to give it a try. They found several and every charity they invited to use CommuniGift taught them something new. They’re still learning and testing the software but according to Doochin, they’re focused on proving their concept and then making it even better. CBS News in Los Angeles sat down with Doochin and Sharp at The Salvation Army in South LA to find out how CommuniGift works. Click here to watch the clip. While they were in town, I had the pleasure of meeting with UNC juniors Doochin and Sharp too. I wanted to know what kind of families create young men like them who focus their formidable energy and talent on giving instead of making money. They said that all three of those involved in those original late night chats grew up in families that engaged in active giving during the holidays and all year long. Doochin’s family would open their gifts on Christmas and then head downtown with blankets, hats and toys for homeless families and kids. 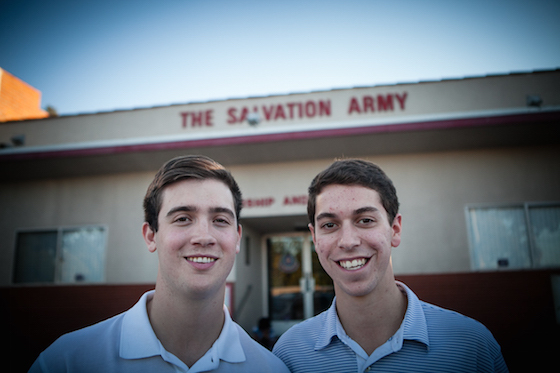 Sharp’s family did Operation Christmas Child through their church. He remembers filling a shoebox with carefully chosen toys and essentials for a child in need overseas. The word “connection” comes up a lot in conversation with Doochin and Sharp. If it’s true that entrepreneurs enter the marketplace with an idea that will solve a problem or make life easier for people, then CommuniGift’s founders – which now include a fourth named Jack Wohlfert – are hoping that their online platform will help people make purposeful connections in a user-friendly, online format. Charities who’ve agreed to work with them upload information about those in their Adopt-A-Family program and a page for that charity is created on the CommuniGift site. Donors follow the link to the charity’s page, create an account, and begin searching for a family using drop-down menus of characteristics that are meaningful to them. Each family member is listed along with the presents they’ve requested. The gift items each link to one of dozens of online retailers, so when the donor checks out on CommniGift, each item is purchased in a single transaction and then shipped to The Salvation Army unit where the family registered for service. To find out how you can use CommuniGift to support your Adopt-A-Family program or product drive, email Thomas or Taylor for more information.